Last week, I was looking to feature a Goddess of the Hearth since moving and homelife was on my mind. However, on Thursday, I came across two things that pointed me towards the Goddess Demeter. First, for fun I randomly took this test, and found that Demeter is my "Goddess Sign." (Note that the "test" is heavily weighted towards the Hellenic Goddesses, so take it with a grain of salt). Second, I read that "Demeter represents that part of us that finds some joy in living even after the complete disruption of a happy home life. We all have to fight our way through old patterns and preconceived notions to confront the power of the nurturer in order to learn about holding on and letting go." The words resonated with me. I was in the midst of my first week transitioning into living with Boyfriend, and for both of us the week had been less than ideal. I started writing about Demeter on Friday, and on Saturday, Boyfriend and I had a serious talk and made up. On Sunday, we had a wonderful day together. Coincidence? I don't know, but I'm not taking any chances. Thank you, Demeter. Demeter, the Greek Goddess of the Harvest, was a fierce mother goddess, who gave humankind the gift of the harvest. 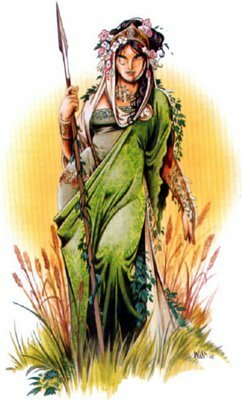 Demeter is credited with teaching humans how to grow, preserve, and prepare grain, and she was thought to be responsible for the fertility of the land. Cults devoted to the Goddess Demeter existed as early as the 13th century B.C., and Greek peasants continued to worship her through the Middle Ages. In Greek mythology, Demeter was born the daughter of the Titans Cronus and Rhea. She was a sister of the Goddesses Hestia and Hera, and the Gods Poseidon, Hades, and Zeus. In Roman mythology, Demeter was called Ceres. Demeter's attributes include a sheaf of grain, a conical headdress, a torch, and a sacrificial bowl. Demeter is best known for her fierce defense of her daughter, Persephone (also known as Kore), a child she conceived with her brother Zeus. Persephone was beautiful, joyous and filled with grace, and wherever she danced, flowers sprang up. 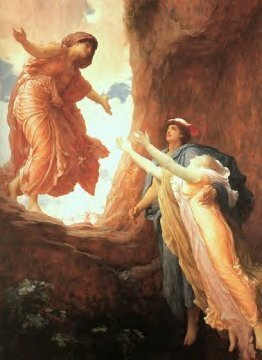 Demeter loved Persephone so much that she could not bear to be without her. When Demeter sat on her golden throne in Olympus, Persephone was always on her lap. When Demeter went down to earth to look over her trees and fields, she always brought Persephone. So lovely was Persephone that she caught the eye of her Uncle, Hades, the God of the Underworld. Hades fell in love with Persephone and decided to make her Queen of the Underworld. Because Hades know that Demeter would never agree to his plan, he decided to abduct her. One day, while Persephone was picking flowers in a meadow, she strayed away from her nymphs and her mother. Suddenly, the ground split open and from the darkness of the earth came Hades on a chariot drawn by black horses. Hades snatched Persephone and dragged her into the Underworld, where he allegedly made her his Queen. It happened so quickly that no one knew what had happened to Persephone. Demeter was distraught and filled with grief over the disappearance of her daughter. She ran about the earth searching for Persephone, and all of nature grieved for her loss. Flowers wilted, fields grew barren, trees lost their leaves, and people and animals went hungry. The Gods begged Demeter to bless the earth, but she refused to let anything grow until she found Persephone. Finally, Demeter learned that Hades had kidnapped her daughter. Enraged, Demeter told Zeus that she would never again make the earth green unless Zeus commanded Hades to return Persephone. So as not to let the world perish, Zeus sent Hermes to the Underworld where he told Hades that he must let Persephone go. Hearing the news, Persephone was overwhelmed with joy. She leapt to her feet with excitement, but Hades only smiled. Hades had tricked Perspephone into eating a few seeds of a pomegranate, and he knew that because she had tasted the fruit of the dead, Persephone must return to him. Instead of forcing Persephone to be bound to the Underworld for eternity, for fear of Demeter's wrath, Zeus commanded that Persephone must spend one month each year with Hades for each pomegranate seed that she had eaten. Every year, when Persephone left Demeter for the Underworld, Demeter was wracked with sorrow, nothing grew, and there was winter on earth. But as soon as Demeter heard the footsteps of her daughter returning to earth, she blessed the earth and it burst into bloom. Spring had come. As long as Demeter and Persephone were together, the earth was warm and fruitful. Circle of Trust or Enemy Camp?